The champs made it to league play last week. Then the champs reminded everyone that they are still the defending champions of the Trico League. 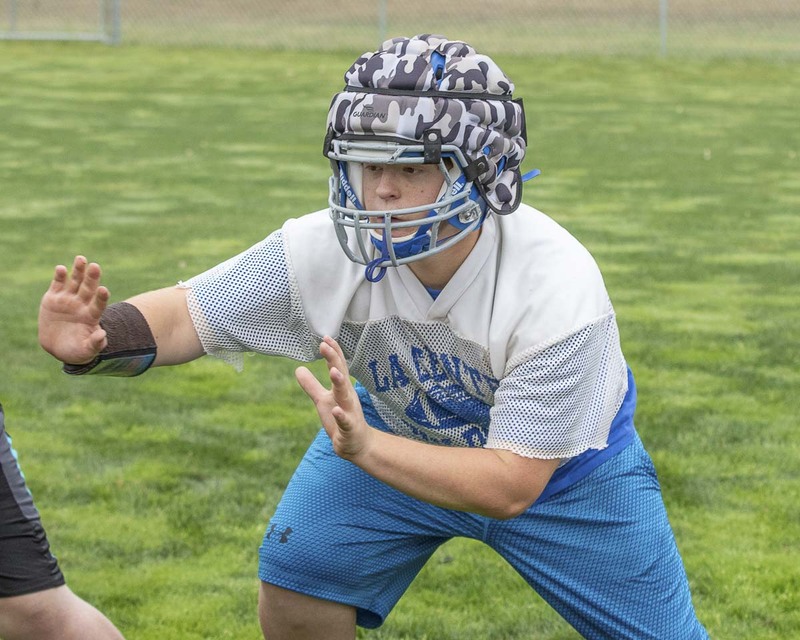 A brand new team — seriously 20 new starters — and a tough schedule left the La Center Wildcats at 0-4 for the first time in coach John Lambert’s long tenure. But he knew they were improving. Once league play hit, the Wildcats proved him right. King’s Way Christian played tough for a half, three quarters even, but it was all La Center down the stretch. Sam Kitchel has made a name for himself at defensive end. Not a starter at the beginning of the season, now he is too good to take off the field. The coaches knew he had talent but his play has surprised them, Lambert said. “He’s so instinctual and quick, which we didn’t anticipate,” Lambert acknowledged. Wyatt Dodson continued his strong season at linebacker. A star running back, this is his first year starting on defense. “We give him a lot of freedom to make plays,” Lambert said. Dodson also rushed for 150 yards in the win. Tom Lambert was efficient at the quarterback spot. Andrew Scott had a 100-yard receiving game. For the linemen, a shout-out to Cyrus Zumstein, who had several pancake blocks for the Wildcats. Next up for La Center is a road game at Stevenson. Just about every team in the Trico is looking at this year’s La Center team as the chance to get the Wildcats. Stevenson, clearly, has an opportunity. For first-year coach Brian Rodriguez, it was nearly the perfect way for his first league game. Everything except the result on the scoreboard. La Center has won the past two Trico League titles. Plus, it was a perfect night for football at a special place. La Center really supports its team. Even though the Knights are a small school in a small league, their school is in Vancouver. Playing in La Center, Rodriguez said, had that “small-town feeling” and his players were excited to be part of that event. The Knights even played the defending league champions tough for three quarters. He was still impressed with his team’s preparation. Bryson Metz had another 100-yard receiving game for the Knights. Mason Packer had a strong day on offense and defense. Lambert told Rodriguez after the game that King’s Way quarterback Kemper Shrock looks like a completely different player this year, playing with confidence. If Stevenson is one of the top teams in the Trico League, then Seton Catholic is not that far off this season. Yes, the Cougars are improving, and proving they belong. Seton Catholic had a third-quarter lead in Week 5. After the third quarter, Stevenson was only up by a point. Sure, the Bulldogs would get the next two touchdowns to take command, but this was a battle. Taj Muhammad, by the way, who seems to find the end zone in different way every week, had a touchdown run for the Cougars and also an interception return for a touchdown. Next for Seton Catholic is a road game at White Salmon.